Warren Gatland was full of praise for Ireland’s five-try display, but his tone wasn’t completely sincere. 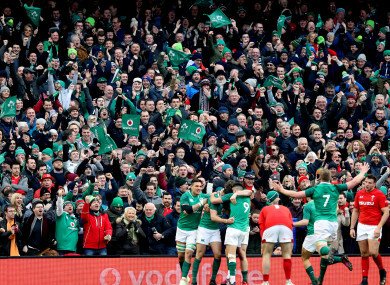 THE VERBAL JOUSTING that proceeded Ireland’s gripping 37 – 27 Six Nations win over Wales was put, somewhat tentatively, on ice post-match after impressive attacking displays from both sides delivered a total of eight tries. After unveiling his team-sheet on Thursday, Joe Schmidt took a thinly-veiled swipe at comments Warren Gatland made all the way back in 2015. Back then, Gatland criticised Ireland’s limited style of play and Schmidt chose this week to question why his compatriot’s words held such ‘credence’. Having watched his charges take a lead, fall behind and then ultimately fall short of a dramatic late win, Gatland was asked if Ireland’s attacking style has improved. “I thought they were outstanding,” said the 100-match Wales coach. Gatland might have stopped there, he wasn’t afraid to end earlier answers after just a single word. But on this occasion he seemed keen on over-egging the pudding. Given that his side had conceded just two tries in the last three Six Nations meetings with Ireland, the five shipped today are indeed testament to a more clinical, confident Irish approach with the ball in hand. But the deadpan delivery from Gatland gave his words a hollow tone. “I played with Gats, I’ve known him a long time and we’ve been sparring partners for a while,” nodded the Ireland head coach, before injecting a wry punchline of his own. I would offer the same thing: I thought they were pretty exciting – I thought we helped them be exciting at times, which isn’t something we’re trying to do at all. “Other people make assessments, I wouldn’t say I look as much at the performances of our opponents once a game is done. I look at our performance. “And the performance I’m interested in now is the Calcutta Cup and what Scotland and England do. “I had a chat to Rob Howley as well, he’s a top man as well as a really good coach. It’s great to have those relationships. As Schmidt pointed out, once the press conferences were done and dusted, all eyes turned to Murrayfield and Scotland’s encounter with England. The upset forced by Gregor Townsend’s men made so many giddy expectations for a Grand Slam showdown on St Patrick’s Day null and void, but upped the ante considerably for their match in Dublin in two weeks’ time. “Wales were coming here knowing their Championship was in the balance,” said Schmidt, not yet aware that Scotland will come under the same circumstances. “When you get a team that’s desperate to win it can be very, very difficult to break them. But to get max points is something we’re very happy with. If Ireland can end the title aspirations of another celtic nation, then the Grand Slam talk will no longer be avoidable. Email “'I apologise to Joe if I upset him': Schmidt and Gatland trade frosty compliments”. Feedback on “'I apologise to Joe if I upset him': Schmidt and Gatland trade frosty compliments”.